It’s not uncommon and is considered a defect although some people use it to their advantage by filling it with a contrasting color. Not worth the time with a 2×4, just cut out the bad and toss it. The first picture is pith, that is the very center of the tree. The second picture is beetle damage. The third picture is rot. In framing lumber the pith is generally not a problem unless the juvenile wood around it is causing excessive warp. A few beetle holes are not a problem unless so severe as to weaken the board. Rot can be a problem as it will significantly weaken the framing member. 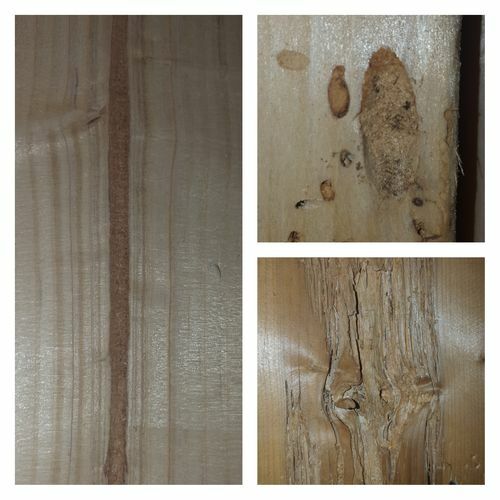 Ways to avoid these defects is to look for them when buying and reject those boards. When they show up in lumber you have brought home, try to cut out most of the problems, Set aside any defective boards and use them for the shorter stuff like cripples and headers, where you can cut out problems. Thank you very much for all the replies. I spent so much time on line trying to figure all the stuff out. Those pictures are taking from two wood studs that I have in the basement ( 3 year old home). I will try to keep a close eye on that stuff, and probably at some point replace the rotten stud, as the center seems hollow. Is any of the problems that you mentioned spreads or will it stay stagnant? Also when you say beetle damage, do you mean anything ranging from a beetle to a termite or its an actual beetle. I have not seen any bugs in the area.